New Yorker Sadie Maddox is the toast of the classical-music world-and a bit of a diva. But lately her CD sales are sagging, not to mention parts of her anatomy. Maybe it's time for a change. So when her agent suggests a professorship at a small liberal-arts college, Sadie decides to give it a go. Besides, she needs the money. But the college is in rural Iowa. Sadie's colleagues are intimidated, her students aren't impressed, and she has to live far too close to farm animals. When Sadie meets Mac, a veterinarian, she assumes they have nothing in common-he is, after all, a country-music fan-and she's counting the days until she moves back to New York. Yet, when Sadie is forced to spend time with Mac, she likes him. Her students really need her. And this quiet Midwest community begins to grow on her. When the semester ends, Sadie packs up and decamps for the city that never sleeps...and finds she can't either. 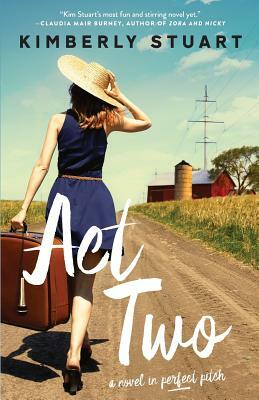 Will she find the courage and grace she needs to embrace her Act Two? Kimberly Stuart is the author of the Heidi Elliott series and three other stand-alone novels. With her trademark humor and offbeat characters, Stuart writes romantic comedies that are intended to make readers laugh often and cry once. Maybe twice. Any more than that and you're not jiving with her sense of humor. Kimberly makes her home in Iowa with one fantastic husband and three wily children.